Hello, I'm new here and to spriting in general, so I'm looking for advice. I'm not good at all at antialiasing, and the folds are pretty simple, so any advice in those areas is especially welcome. These sprites have unfinished colouring, so I post them mostly to show the animation. I'll post some enemy sprites later. This is very nice work. The character has great resolution and personally I like it without serious antialiasing. The scale is excellent also. I'm not an expert, so I also have some beginner questions for you about the animation. Looking at your lineart, it's very clean and also proportionally correct. Do you pencil sketch, scan, and trace? Do you work entirely in digital? For the experts here, it's probably very obvious, but could you please mention your workflow and software you use? For example to animate, does your software support onion skin and etc. I myself have access to pro motion, graphics gale, aseprite and grafx2. I also tried pixeling with gimp and photoshop, but I have not been able to successfully find a good way to animate most of my thumbnail sketches or characters. No real workflow, so I'm always looking to find a good example to animate character sprites. Is the lineart cleaned? There are still some oddities left. In the fourth one, the double punch, her right foot is making some really weird movements. I guess that all of them look fine alone, but in motion her foot boils, and doesn't really follow the ground. The same goes for the lines for her knees, which goes in and out of existence. I believe that adding or removing the lines, even if it makes every standalone frame a bit less proper, makes for a less janky animation. The second one, the crouching punch, she throws her punch from her chest. That makes it kind of a slap instead of a straight punch. The knife also moves a lot. It would probably look better if it was held a bit more still. I really like the speed on the low swing with the knife, with a large swing being done in one frame. The other attacks look a lot weaker because they have more inbetweens. They would probably look snappier and more powerful with less frames between start of punch or stab and the full extension of the arm. Character and animation looks pretty great, an incredible amount of work at this size. Are you rotoscoping from something? What's your process? Run pops a bit, you have a couple of close poses on the front leg (I think?) that need distributing better, so it doesn't slow down on the high pose. if you change the timing, ie take out the frame with the arm behind her neck, maybe replace it with a frame at the end of the punch to wait a beat before she starts to pull back. mrpixel: Yes, I draw on paper with pencil (I have a grid drawn on tiny 10cm x 10cm sheets for reference), then scan and trace. It's probably not the most effective way of doing things, but I don't have a tablet and I'm too accustomed to pencil and paper. Neophos: The animations are still a bit rough as I tend to correct stuff when I color, but I hadn't noticed the problem in the feet, thanks. As for the punch, the game will have 3 attack buttons, punch, kick and slash, with punches being light attacks, kicks mids, and slashes hards, so it's supposed to be a quick light attack. You are right about the knife, I'll try to keep it more static. I'll see if I cn change the timing of the other moves a bit. I put more frames on them since they are special moves and need to be slower, but probably the timing is off. rikfuzz: No rotoscoping, but I referenced the run from Eadweard Muybridge's "The Human Figure in Motion". The attacks I pre-plan very roughly on paper and then draw them when I have them mostly defined. I referenced timings from SNK and Capcom fighting games. I'm not ultra methodic like real animators, which in the end probably makes me waste too much time. I'll check that run, thanks. You are right on the contrast bit, I'll try to make highlights stand out more. shark jacobs: I took out a frame on the startup and I think you are right, it has a bit more impact. I think I put too many frames on the startup of some attacks, with bad timings. The woes of being a noob at this haha. wolfenoctis: Which particular proportions would you say are off? I tried to make legs as high as the upper body, the whole body roughly eight heads high, the waist a bit less than one head, etc. 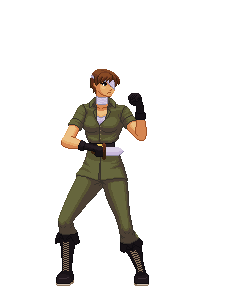 I remember my very first sprites being REALLY off proportion-wise (like the waist being like 35 pixels wide haha) and not being able to tell by myself until a lot later. Some other animations, with unfinished colouring. A regular enemy with unfinished colouring. Suggestions for the shield colours? Not sure how to do the mail either. 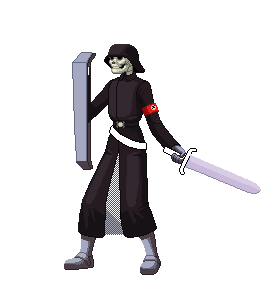 Some colour theft herer, heh, the skull I got from Bornnam's portrait in Shippu Mahou Daisakusen, and the metal colours from Cyangmou's zombie knight pic. I'm terrible at palettes, sorry. Can't believe I didn't see this before now. If there's one thing I want to see more of in video games, it's HD pixel art games. Same technique as was used on 320x240 pixel monitors, but adapted for 1920 x 1080 pixel monitors. I hope this stuff is used for a game. The knife attacks look really good. But the punches look wrong to me, particularly the one where she's standing and hopping forward with a jab. Now, I'm a bit of a purist when it comes to close combat in computer games, because I always want as much realism as possible (unless someone's shooting a hadoken fireball). Good, realistic techniques are just more beautiful than sloppy techniques. I don't know why, but I think the eye picks up on awkward movements, like when you see someone who doesn't know how to run or dance. Here are my thoughts in regard to this hopping jab. - If she's going to step into her punch, it would be better if the punch landed the second her foot hits the ground. That gives her momentum as she's pushing off her rear leg, so the power moves from her feet to her hips and all the way to the punch. - It's better if she has a good base when she lands the punch. Right now her hips tilt forward when she lands the punch, bringing up her rear leg from the ground as if she's tipping forward, off-balance. Instead, her hips should be level and her rear leg should be pointing in the direction she's punching, so she's using her foot to push herself forward, like she's running. - Lifting the elbow is a common mistake when punching with the rear hand (a cross), but it's actually kind of awkward and difficult to lift the elbow like that when jabbing with your lead hand - especially because she's stood sideways, instead of angling her shoulders towards her enemy. And it doesn't look very pretty either, it just looks like an untrained girl punching. Which is fine, if she's supposed to look untrained. But I think it would look more natural and prettier if she didn't lift her elbow like that. I'm biased though. I'd like to see her hand extend the same way she pulls it back. - She's either punching a midget or hitting a normal person in the chest. Why not aim for the head, or the stomach? Some people here will definitely disagree with me, arguing that it's better to exaggerate movements rather than worry about realism, for the sake of dynamic animations. - Way too skinny. I know it's a skeleton, but it just looks comical to see a skeleton with normal proportions wearing clothes. Tiny waist, narrow shoulders, narrow hips, etc. I would exaggerate the dimensions, especially of the shoulders and ribcage, if it's intended to look at all intimidating. - Helmet looks like it doesn't fit. It looks like a small boy wearing a fireman's helmet, which almost gets in the way of his eyes. I would raise it a little bit or change the design. - The stance is very awkward indeed, like it's about to fall backwards. This makes the skeleton look even less intimidating. I would either make it look stout and powerful, like a golem, or hunching forward and dragging its feet, like a zombie. Probably the former, since it's supposed to be a soldier. I'm not going for realism, my influences come mostly from Capcom / SNK fighting games rather than real martial arts, of which I don't really know much about, so I can see the attacks looking awkward to a martial arts fan. As for the punch height, I don't want it to miss crouching enemies. It's based on Fei Long's Rekka Ken, and it's a multi-part attack too. I'll see what I can do about the skeleton. I don't want to make it too exaggerated, but I'll see if I can buff him up a bit. I won't make him zombie-ish, but I have other enemies that will behave zombie-like, so I'm sort of going to use that idea after all, hah. Don't worry about being too critical, that's the sort of criticism I'm looking for.